Because its 72 degrees outside, I’m going to stitch for the afternoon. My laundry room will still be a disgusting mess on Monday. I’ll clean it then. Because that green circle needs some embellishing. Categories: Uncategorized | Tags: stitchery, Sue Spargo, Wool | Permalink. I’ve disappeared for a week again, didn’t I? My sister and I spent five days in Tipp City, Ohio at a stitching retreat called Workt By Hand. This year is the tenth annual retreat, hosted by Ali Strebel, Sue Spargo, Sally Korte, and Melissa Becker. It was a blast. The learning curve was steep, because I haven’t done much of this type of stitchery before. Just to give you an idea of what we were doing, here is a project by Sue Spargo. Our theme this year was Circles. This is Ali Strebels project. It’s the top of a hassock. And a butterfly by Sally Korte. We were given a wool background. I started out being a rebel and purchased black wool instead of the light neutral we were given. 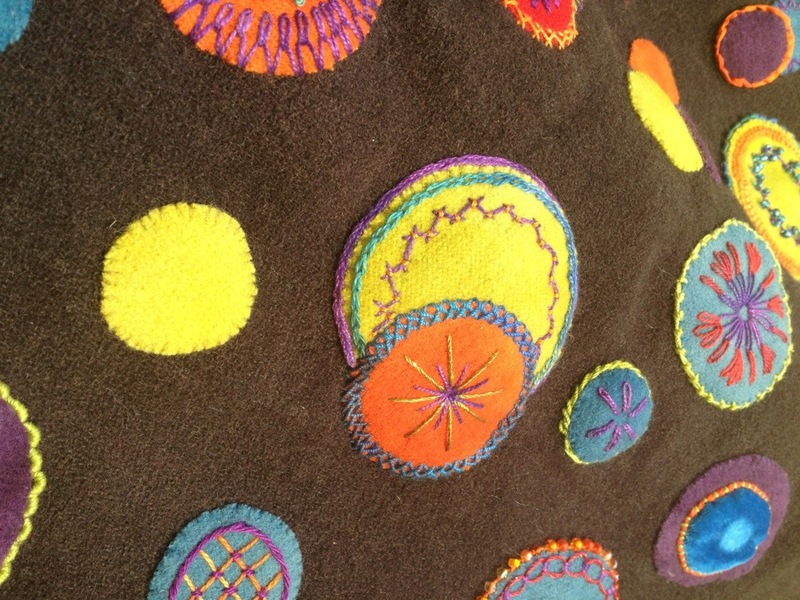 I always have to do my own thing… I then chose my colors from some wool I had along and started cutting circles. The rest of the day was spent stitching all the circles down. The next day, I started learning decorative stitches. Here are some things I’ve done. You can see on the orange circle how the wool is stitched down with a wool/nylon thread. I decided I wasn’t ripping anything out, because this is my learning project. On some of the circles, you could see how my stitching got better as I went around the circle, but I’m ok with that. Sue Spargo taught me how to stitch this little cutie! I managed to acquire some fun threads and ribbon to work with! I’m still going to add some silk and velvet to the embellishing as well. Fiber of any sort just makes me smile!!! Here’s my whole project. I feel like I’ve spent a ton of hours on it already and there are still a lot of empty circles! If you’d like to see more photos, Sue Spargo did a blog post on the retreat and Ali Strebel is planning to do one but hasn’t as of now. I’d like to sit and do just one circle right now, but it doesn’t work that way. I stitch one thing, and two hours later, I’ve done several more. For now, it’s time to get back to the ginormous quilt! Categories: Uncategorized | Tags: applique, stitchery, Sue Spargo, Wool, Workt By Hand | Permalink. Last week I showed you some fabric and yarn that I dyed. I didn’t show you the really cool stuff yet! Let me back up. 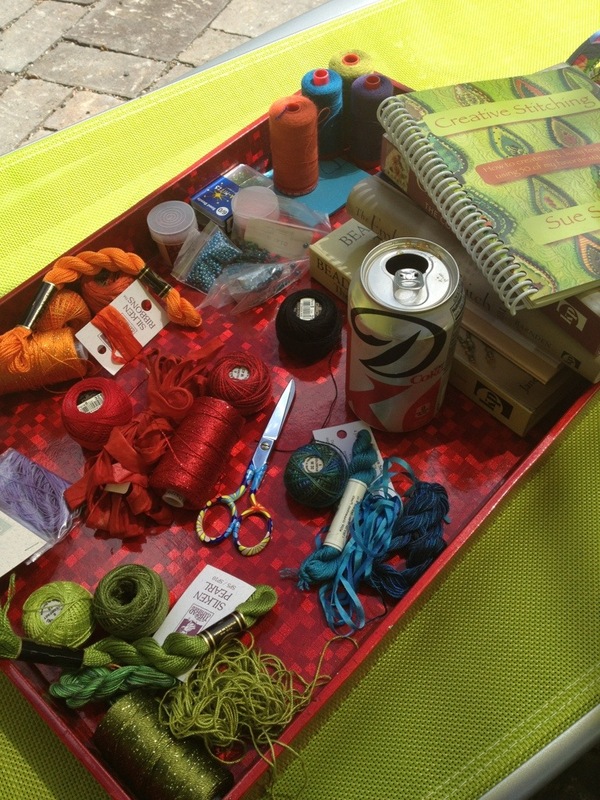 In June, Heather Peterson of Anka’s Treasures, did a post on Quilt Market. She included this photo of Sue Spargo’s booth. See that quilt on the right? Yeah! I did too. I drooled all over Sue Spargo’s website! I stared longingly at the kit. I finally broke down and ordered the book called Contemporary Folk, which includes this pattern, called Silk Road. I played with dyeing wool. I stared longingly at the kit some more. I ordered 5 yards of 100% wool on ebay and practiced. Guess what? I did it!!! I dyed all the wool, velvet, and silk for this project. It took me two days to dye all the colors I needed, but I’m thrilled with the results. Look at that velvet! Believe it or not, this velvet started out pale pink. It was the only light color I could find that was rayon. I’d love to buy more and make a shirt out of it! I think this is going to be a January project for me. This pile is hanging out in my sewing room. Every so often, I wander in there and pet it! Last night, all the dyeing stuff was packed away in the basement. It’s too cold to be outside dyeing stuff. And that’s ok, because I need to start using some of the fabric and yarn I’ve been dyeing. But first, I need to clean up the pile of clothes on the edge of my bathtub. Oh…I almost forgot. I didn’t tell you the end of the sewer saga. We dug a huge hole in our front yard, cut the pipe, and got it unplugged. I’m not giving you any detail, because it was just too disgusting for words. Let’s just say I realized it was going to get ugly when the plumbers newest hire put on waders and rubber boots. A toilet is a wonderful thing…especially after it hasn’t worked for 4 days! Categories: Uncategorized | Tags: Anka's Treasures, Dyeing, Sue Spargo, Wool | Permalink.